We love our pets and all want to take care of them the best possible way. Afterall, they are our best friends! From food, to vet care, to grooming, boarding and home care with essential oils, we want YOUR pet to live as healthy and abundant life as possible! Join us at beautiful Main Stay Therapeutic Farm for a day chock full of information that will benefit your loved 4 legged family members. Dorothy, owner of Nature's Feed in Spring Grove, Dr. Brand of Richmond Veterinary Clinic in Richmond, and Liz Bappert of CanineEo in Richmond are teaming up to help you be proactive with your pet's wellness at this fun and educational seminar. 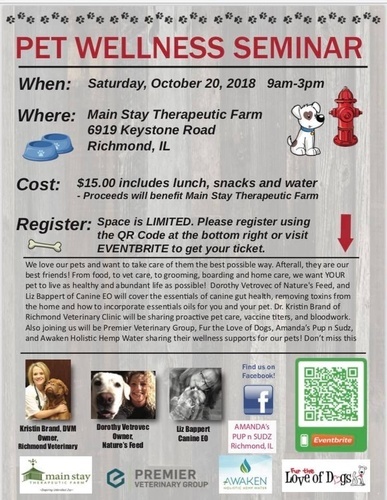 Additionally, we are so excited to have Premier Veterinary Group of Grayslake, Fur the Love of Dogs of Spring Grove and Cassandra of AWAKEN Holistic Hemp Water join us to speak about other wellness supports that benefit our furred friends. There will be time for questions and discussion, too! Please remember to bring a note book or your tablet to take notes. We will have bottled water and some fruit available for snacking. Lunch includes a sandwich and chips. A gluten free option of salad is available with prior arrangement. Attenders will receive a goody bag, too! SPACE IS LIMITED to only 48 persons! Tickets will not be available at the door. LUNCH is INCLUDED if tickets are ordered by 10/17/18. IF YOU REQUIRE A GLUTEN FREE OPTION, PLEASE EMAIL Liz at lizb@mindwerkz.net with your name and she will email you back to confirm she received your request. Please direct questions to lizb@mindwerkz.net. Thank you! Proceeds of this seminar will benefit Main Stay Therapuetic Farm and the clients they serve. To learn more about Main Stay Therapuetic Farm, please visit www.mainstayfarm.org.